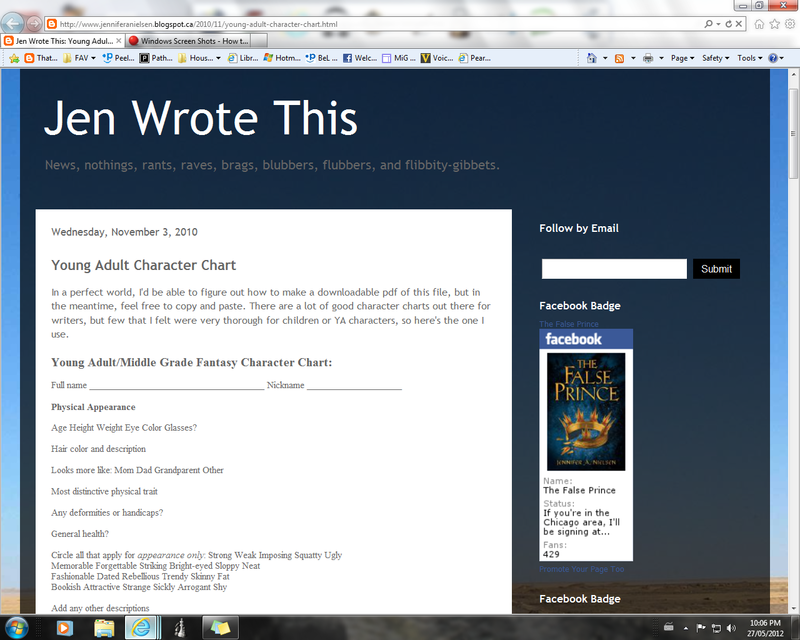 Do you use a character chart for writing children's books? How do you construct your characters? I actually have worked on my writing on the subway, but I've never taken a workshop on one! Local editor and creative writing instructor Brian Henry sometimes holds writing workshops at The World's Biggest Bookstore in Toronto, but I haven't been to one there yet. Where's the craziest location you've ever attending a writing workshop or done any writing? To create villains with depth, it’s important to consider positive character traits as well as negative ones. I love the character of Severus Snape in the Harry Potter books, because early in the series, Harry sees him as a typical, mean, unlikable villain, but as the books move along, Dumbledore has mysterious faith in him, and it leads me, as a reader, to question how I feel about him. Give the villain a brain. Villains are smart, as clever or even more clever than your hero. That means the writer has to be smart in creating situations where what the villain is going to do isn't obvious or typical. Think beyond traditional negative traits. What mades your villain different from lots of others out there? What is unique about her? Consider the positives. Think of your characters on a continuum from good to bad, with none of them completely at one end or another. People aren't completely good or evil, so characters shouldn't be either. What makes your villain a little bit good? (You can also think about what makes your hero a little bit bad). Donald Maass suggests an exercise where you think about your villain from the point of view of your protagonist, and find three ways they are alike, and one way they are different. Then think about the thing about your villain that your protagonist will never understand. Revisit your story from the villain's perspective. What does he or she want? Are his actions consistent with how he's going to get it? The villain needs a strong motivation, just the way your protagonist or hero does. The story should make sense and develop from the villain's perspective too. How do villains in MG novels differ from villains in YA or adult novels? Many people might say that villains in MG novels are less mean or less violent. I’m not sure that’s true. But more of the violence or mean behaviour may be “off screen” rather than being described in gory detail. Villains in upper MG books may be more violent than villains in younger MG books, in proportion to the plot conflict. Villains in MG books often have more humourous or even ridiculous characteristics, in keeping with the tone of the novel, of course. How do you make your bad guys convincing to the reader? What villains stand out to you as unique? Barbara Watson and her followers discuss how depth and layers make for a good rascal in a MG novel. In Muahaha! Does Your Villain Have What It Takes? 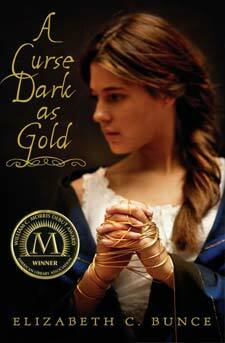 author Amy Kaufman talks about writing villains for MG and YA books. Over at Project Mayhem, Hilary Wagner gives us examples of great villians in children’s literature. The thrilling first book in a brand-new trilogy filled with danger, deceit, and hidden identities will keep readers clinging to the edge of their seats. In a discontent kingdom, civil war is brewing. To unify the divided people, Conner, a nobleman of the court, devises a cunning plan to find an impersonator of the king's long-lost son and install him as a puppet prince. Four orphans are recruited to compete for the role, including a defiant boy named Sage. Sage knows that Conner's motives are more than questionable, yet his life balances on a sword's point - he must be chosen to play the prince or he will certainly be killed. But Sage's rivals have their own agendas as well. I had so much fun reading this story, I didn’t want it to end! 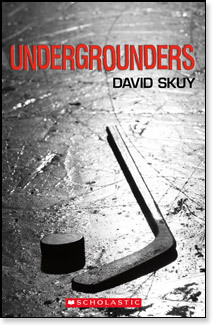 The story moved along at a good pace with lots of twists and turns, but it was easy to follow. I liked the way the author included just enough detail without weighing down the story. 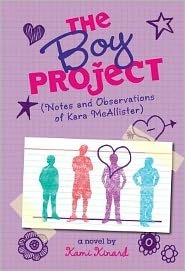 And I especially enjoyed the main character Sage’s attitude and sense of humour. He is a complex character with many layers. In this story there is some violence, including sword play and fighting (a boy gets killed by an arrow) so I’d say it’s more suitable for upper middle grade readers (e.g. ages 11-14) or as a read aloud with a parent. As a writer, I’ll return to this novel to study how the author creates a strong and engaging first person voice. Jennifer Nielsen is writing Book 6 in the Infinity Ring series (an alternate-history time travel series for readers ages 8-12 written by multiple authors, similar to The 39 Clues). 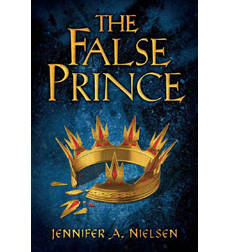 Scholastic Entertainment has optioned movie rights to The False Prince and other books in the Ascendency trilogy. For more, visit Jennifer Nielsen’s website. If you were following the Silver Birch fiction postings I made on my blog, you may also know that the the results are in! I'd never read all of the nominated Silver Birch novels before, so I found it a lot of fun. I ended up reading some books I might not have chosen if I'd been scanning the shelves in the library. This one was a compelling story, so I'm not surprised it was so popular with students. Lately I’ve been thinking about stories I read as a child that influenced my writing and my life. The “Little House” books by Laura Ingalls Wilder were definitely among my childhood favourites. I think I was first introduced to them by my mom, who read aloud The Little House in the Big Woods. After that, I raced through the rest of them and read them over and over. I was fascinated by the details of life in a different time. I cheered along with Laura as she got even with the bully Nellie Oleson in On the Banks of Plum Creek and I loved the simple romance of These Happy Golden Years. It’s funny how you notice different things when you read as an adult. As I child, I used to be bored by the whole story of The Long Winter, where Laura’s family was trapped in their house by blizzards, grinding grain in a coffee mill, but I now am fascinated by how they survived their hardship. As an adult, I’m a little disturbed by some of the racial attitudes in the early books, even though I can appreciate that they are consistent with the time period and need to be considered in context (for more see Little House on the Prairie: Racist or Not? ). What influenced me most as a writer was not the content or the history in these books but the way they were written. I still admire Wilder’s writing style. It’s straightforward and simple, but it contains lovely imagery that helps me picture the scenes in my mind. The style changes a bit through the series, as the main character Laura’s age does – the earlier books have shorter sentences, whereas the older ones seem more fluid to me. To me, this not only shows her awareness of the age of the audience, but also her increasing skill as a writer. Something I strive for in my own writing is that combination of straightforwardness and vivid imagery. What author’s writing style do you admire? 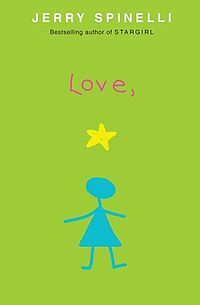 Are there any books from your childhood that stand out in your mind because of the writing style? On Mondays, I usually have a Marvelous Middle Grade Monday post, but not this week. Today I'm participating in Angela Ackerman and Becca Puglisi's Random Act of Kindness! I am picking Marcia Hoehne, who has been one of the followers of my blog from the very beginning. On her own blog, she has thoughtful posts about writing, book reviews and she even holds contests for free critiques! Just so you know, her critiques are excellent. Marcia, for my RAOK gift, I'm sending you an Amazon gift card! I really appreciate Marcia, who blogs at Marcia Hoehne (http://marciahoehne.blogspot.com). If you have a minute, please stop in and tell her how awesome she is! This week, Marcia Hoehne posted some interesting tips on plotting (To Plot or Not) based on her reading of James Scott Bell. She discusses how it's important to figure out what works for you. Now that I've made it to Novel #4, I'm finally starting to get a kind of system for plotting. I've always tried to make some kind of outline or summary first. I think it works for me. But it occurs to me that I've never really tried the other approach - the "fly by the seat of your pants" approach. I have to confess, the whole idea of trying to sustain a story without any kind of outline scares me a little. But I also wonder if I can do it. Then I realized I kind of already am. As a "warm up" to get myself in a writing mood, I started with just writing whatever comes into my head. But it's turning out to be another story. I have no plot chart, no character chart, no nothing except whatever pops into my head at the moment. And the ideas I record in my notebook as they bubble up at odd moments. I have no idea if it will develop into another novel, but I'm having a lot of fun with it. Do you outline or not? Have you ever taken a serious stab at using the other approach? 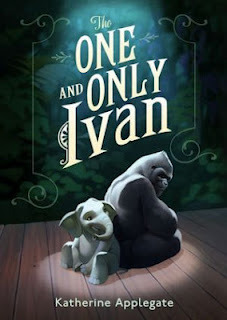 I really enjoyed this story of Ivan, a male silverback gorilla living as a roadside attraction at a shopping mall. It’s a story about family, friendship and the feeling of home, told from the point of view of the gorilla. This story really tugged at my emotions. I loved the simple, but poetic language, and the verse style in short chapters that fit so well with the gorilla narrator. I read the entire novel in one afternoon, partly because the writing was easy to read, but also because I was so wrapped up in the story. This novel explores some of the same issues as Half Brother by Kenneth Oppel, but in a different way. According to the Simon and Schuster website, Ms. Applegate has written over one hundred books under her own name and a variety of pseudonyms. She is married to author Michael Grant. Together they wrote books in the Animorphs series. According to the book jacket, the inspiration from this novel came from reading about the true story of Ivan, the Shopping Mall Gorilla. For more, visit Katherine Applegate’s website. 1) Numbness and shock - "Really? I can't believe that chapter was so bad." 2) Denial - "But I need these scenes to set up the conclusion. They just don't get it!" 3) Depression - "Sometimes it seems like I'm never going to get it right." 4) Working through it - "What if...? Maybe... I could try..."
5) Acceptance - "They were right. The old chapter didn't move the story forward." Even though at first it stung a little, after giving their critiques time to settle, I realized they were right. [It's always a big tip off when more than one person says essentially the same thing.] After some brainstorming, I ended up with a new and much improved chapter. And lots of enthusiasm to continue working on the rest of the novel. 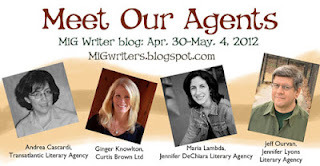 This week at MiG writers, we're hosting interviews with four agents that rep middle grade and YA, asking them some tough questions about the market, misconceptions, and what they are looking for in submissions and in their clients. Check out Meet Our Agents. Up today is Debbie Ridpath Ohi's agent Ginger Knowlton, of Curtis Brown Ltd. Although I try to spend most of my writing time actually writing (ha - we all know how easy it is to get sidetracked), I love reading blogs that give me tips on writing techniques or inspiration. I recently discovered the e-newsletter from Nelson Literary Agency -- you can sign up for it at Kristin Nelson's blog Pub Rants (also a good source of info for writers). In this month's issue, agent Sara Megibow describes middle grade: "fiction aimed at the 10- to 14-year-old reader and runs in the 30,000 to 60,000 word count." She also tells us that agents are looking for all types of middle grade. That's encouraging! Do you know of any other great agent blogs to follow?